Medi Pack Automatic Screw Capping Machine is versatile, self-supported on stainless steel leg with height adjustable adjustment system. 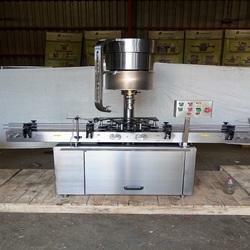 The machine is precision built on sturdy welded steel frame completely enclose in stainless steel sheet and doors are providing to facilitate the servicing of machine. 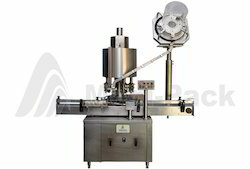 Automatic ROPP Cap Sealing Machine offered comes backed by latest technology support and is ideally suited for handling continuous heavy duty operations. Further, the automatic operation support of the machine as well as support of rotary cap feeding hopper and slat conveyor also makes operation handling easier. 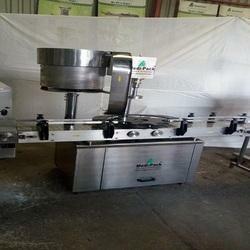 Some of its features include no container no cap system for avoiding wastage, stainless steel matt finished body finish, allows for adjusting height of conveyor belt for precise alignment with other line machines, varied sealing pressure to suit different gauges and size of caps, low power consumption, self-lubricating guide profile for low friction wear. 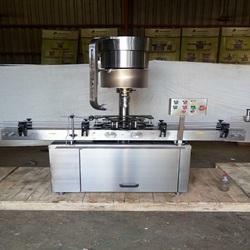 The Automatic Cap Sealing Machine is precision built on sturdy welded steel frame completely enclose in stainless steel sheet and doors are provided to facilitate the servicing of machine. The feed container moving on conveyor belt are fed into star wheel, bringing the container below the sealing head in the subsequent indexing part, mean while the bottle pickup a cap from the delivery chute of cap feeding bowl, where the body and the neck of the container are positioned below the rotating head. Where the sealing head is performing perfect operation of threading sealing. Single motor synchronizes conveyor, star wheel, platform turret. Adjustable height of conveyor belt, to align with other machine of the line. Self-lubricating UHMW-PE guide profile for low friction wears surface, smooth and noiseless conveying. SS cladding or hard chrome platting of all exposed parts to ensure long life and resistance against corrosion. Synchronized A/C drives to synchronize, Conveyor, Star wheel and Platform turret capping bowl. Automatic Screw Capping Machine is versatile, self-supported on stainless steel leg with height adjustable adjustment system. 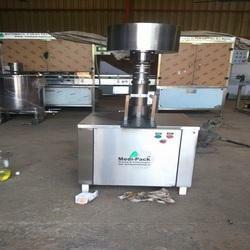 The machine is precision built on sturdy welded steel frame completely enclose in stainless steel sheet and doors are providing to facilitate the servicing of machine. • No container no cap arrangement. • Single motor synchronizes conveyor, star wheel, platform turret. • Adjustable height of conveyor belt. • All contact parts are made out of stainless steel. • Low noise level, low power consumptions. • No cap No container arrangement. • Safety Guard for Operation and Protection. • Specially designed hopper is to increase storage capacity of bowl. Cap Sealing Machine offered provides usage for meeting the capping demands of different industry sectors and can handle flip off cap, plastic cap, aluminum cap and other varieties. Further, the system also allows for handling sealing requirements of products with different neck sizes. Some of its features include provide for efficient and cost effective operation support, easy to operate, advanced thermostat control for adjusting according to thickness of plastic cap, allow easy handling of sealing pad height adjustment for accommodating different sized plastic containers. Fully Automatic Ropp Cap Sealing Machine offered provide for versatile functional support and features stainless steel leg with height adjustment system. Further, the stainless steel construction finish of these machines also makes these lasting in performance. 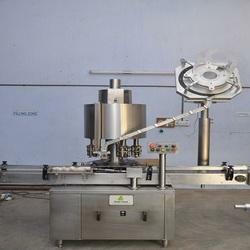 Some of its features include sealing head providing perfect support for threading & sealing applications, no container no cap arrangement, single motor for synchronizing conveyor, allowing for adjustable height of conveyor belt, choice of different sealing pressures suiting different gauges and cap sizes, low noise level, allowing for smooth and noiseless conveying. 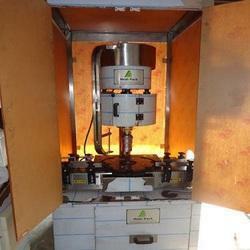 Semi Automatic Screw Capping Machine offered comes backed by latest micro-computer control as well as digital display support so as to deliver optimum working performance as per the specific requirements of the customers. Further, the quality electrical support and positioning device also assure customers of precise and convenient operation handling. Some of its features include suitable for round flat-top cap locking operation, allows adjustment to capping speed and tightness, suitable for capping bottles of cosmetics, chemical, drinks and others. Manual sealing machine offered finds suitability for use in operations involving screwing metal/plastic caps and feature high speed spindle support for delivering quick and reliable operations. 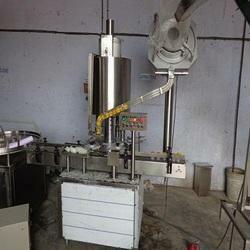 The machines come with high production capacity of 1000 to 1400 bottles per hour. Some of its features include heavy duty performance support, symmetrical four-side sealing support for delivering even power on each side of cap; use of stainless steel food grade metal for hygienic operations, power supply of AC 220V-240V /50-60HZ;110V/60HZ; rated power input (W) of 370; 1430r/min and others. • Low noise level, low power consumption. Single Head Capping Machine offered to find use in container cap sealing operations and find extensive use in industry sectors like household products, pesticides, pharmaceutical, food, chemical industry, and others. 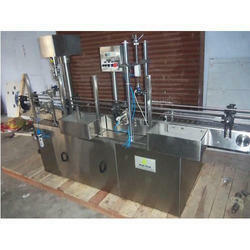 Further, these come with a capacity of 20 to 60 bottles per minute with screw type cap options. Some of its features include voltage supply of 220V/380V,1/3 Phase,50-60Hz; a power supply of 2.2W; machine suitable for medium and high capacity operations, allows for fast and easy change over to many bottle sizes, coming installed with hygienic safety cover, reduced bottle breakage rates, reliable cap pickup arm and others. Filling size 1 ml to 1000 ml. 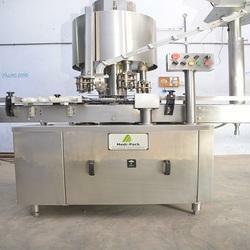 Performing the operations of washing, filling, sealing, labelling and inspection machines. 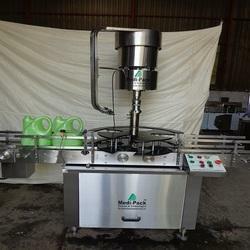 Pet Bottle Capping Machine offered come in quality construction finish and features precision built and sturdy welded steel frame so as to provide easy handling of machines. Further, the system comes with n container no cap arrangement as well as matt finish bases SS body for lasting performance. Some of its features include adjustable height of conveyor belt for easy alignment with other machine of line, allowing for varying sealing pressure to suit different gauges and size of caps, low noise level, low friction wear surface, ensure long life and resistance against corrosion. 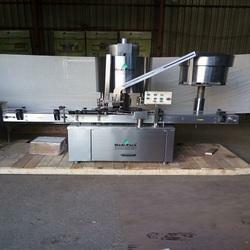 Ropp Cap Sealing Machine offered comes backed by latest technology support and provides for superior sealing support to all types of glass bottles. 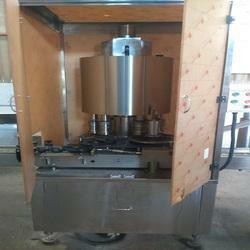 The machine find suitability for use in industry sectors like alcohol, chemical, medicine, cosmetics and others. Some of its features include providing for screw thread sealing support, machines providing for stable operation support, helps in maintaining consistent torque under long term working conditions, machine suitable for capping bottles with different heights and shapes. Single motor synchronizes conveyor, star wheel platform turret. 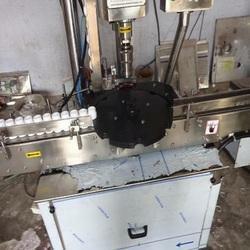 Manual Bottle cap sealing Machine offered come backed by latest technology support and meet the requirement of sealing aluminum caps to glass bottles. These high performance semi auto capping machines allow bottles to be sealed with aluminum Ropp caps and come with four-side sealing support for balanced power on all cap sides. Some of its features include machine provides for better sealing to the bottles, can handle different sealing tightness requirements as per materials of caps, stainless steel metal finish for lasting performance, power supply of AC 220V-240V /50-60HZ;110V/60HZ. No. of sealing head 1 Nos. Overall Dimension 1000 mm (L) x 720 mm (W) x 1400 (H) Approx. Case Dimension 1200 mm (L) x 950 mm (W) x 1600 (H) Approx. Net Weight 200 Kgs. Approx. Gross Weight 350 Kgs. Approx. Change parts required Cap Die if cap diameter change. 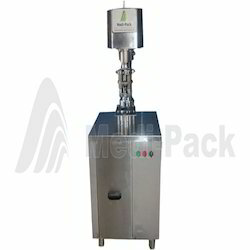 Description : Medi Pack Jar Capping Machine is versatile, self-supported on stainless steel leg with height adjustable adjustment system. 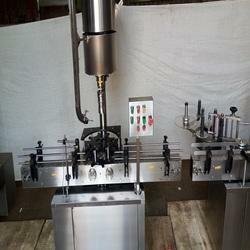 The machine is precision built on sturdy welded steel frame completely enclose in stainless steel sheet and doors are providing to facilitate the servicing of machine. Operation : The feed container moving on conveyor belt are feed into an in-feed star wheel, bringing the container below the sealing head in the subsequent indexing part, mean while the rotating head pickup a cap from the cap star wheel which is receiving from delivery chute of cap filling bowl, where the body and the neck of the container are positioned below the rotating head, where the sealing head is performing perfect operation of sealing, rotating head is design to seal container according to pre-set torque. Automatic Lug capping Machine offered come in precision construction finish and match up with the demands of industry sectors like chemicals, pharmaceutical applications, hazardous solvents and others. Further, these come with filling size of 1 ml to 1000 ml as well as with different output speeds. 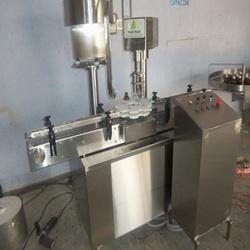 Some of its features include designing of machines as per GMP standards, providing smooth operation support for washing, filling, sealing; single motor synchronized conveyor support, low noise level, self-lubricating guide profile for low friction wear surface, adjustable bottle height gauge for easy and quick setting.